The approximately 80-ha Nee Soon Swamp Forest in Singapore is the last patch of primary freshwater swamp forest in Singapore and home to many nationally and globally rare species. Singapore’s National Parks Board recently commissioned the National University of Singapore to undertake a study of the hydrology and vegetation of this forest fragment. This is a 15-month full-time position with a salary commensurate with qualifications and experience. Interested candidates are invited to send their CV to Anne Quah (dbsqkla@nus.edu.sg). The closing date for applications is 7 January 2011. Shortlisted candidates will be interviewed in the second or third week of January 2011. 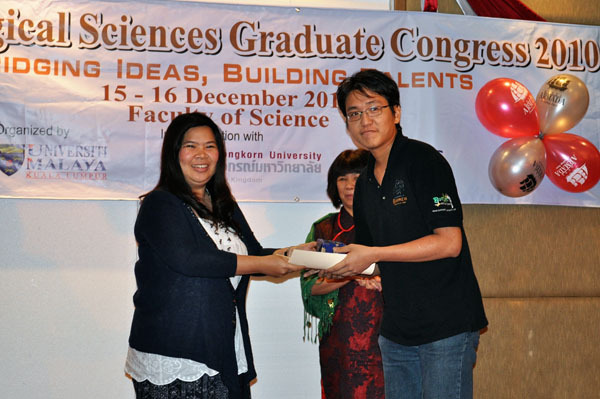 A team of 5 graduate students from the biodiversity crew headed to the University of Malaya in Kuala Lumpur, Malaysia for the 15th Biological Sciences Graduate Congress (BSGC) from 15 – 17 Dec 2010. The annual BSGC is a collaboration between the National University of Singapore, University of Malaya and Chulalongkorn University (Thailand), which takes turns to host the event. Graduate students of research institutions from from the 3 hosting nations, Philippines, India, Japan and the United States present their research in the field of Biodiversity and Ecology, Biochemistry and Physiology, Bioinformatics and Biotechnology and Cell and Molecular Biology. Chong Kwek Yan – Using Herbarium Records to Assess Extinction Likelihood. Chua Aik Hwee Marcus – Can Medium-sized Mammals Co-exist with Man on Pulau Ubin, Singapore. Ng Jia Jun Daniel – Conservation Challenges of a Critically Endangered Freshwater Crab (Johor singaporensis) in Singapore. 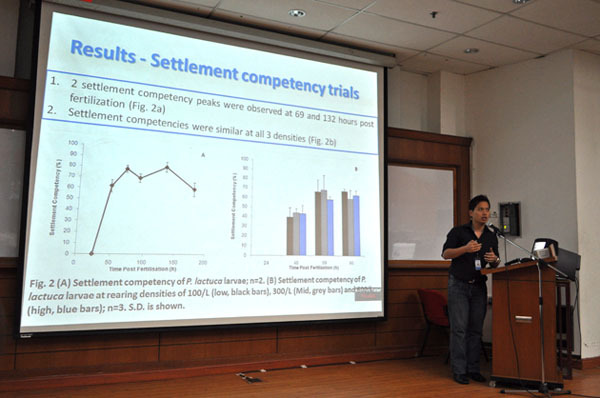 Toh Tai Chong – Optimisation of Ex situ Scleractinian Coral Larval Rearing Techniques for Coral Reef Rehabilitation. Ye Guanqiong – Restoration of Yundang Lagoon (Xiamen, China): Progress and Challenges. Chong Kwek Yan from Plant Systematics Lab did us proud by clinching the 1st runner up prize for oral presentations in the biology and biodiversity category. Well done! The 16th BSGC will be hosted by NUS in 2011. Research Assistant/Technical Support Officer opportunities with the Freshwater Biomonitoring team in NUS. The monitoring of Singapore’s freshwaters is critical for the protection and management our water resources. The Public Utilities Board recently commissioned the National University of Singapore to undertake monitoring of water quality and stream health using freshwater invertebrates as indicator taxa in various aquatic habitats in Singapore. We are seeking for two enthusiastic Research Assistants and/or Laboratory Technicians to join current biomonitoring team. Candidates possessing valid driving license are strongly preferred. Knowledge of freshwater invertebrates would also be advantageous. Experience of ecological sampling protocols and/or working with freshwater macro-invertebrates would be advantageous. However, full training will be provided. Interested candidates are invited to send their CV to Mr Adam Quek at dbsqrf@nus.edu.sg. The closing date for applications is 27th December 2010. Interviews will take place during the the first week of January in 2011.